· LiceBoss on-line learning now on-line! Here, with permission, is information (slightly edited) from Dr Matt Ball, Technical Services Manager (Livestock), Virbac. “A basic field trial using 60 sheep was conducted recently on a New England, NSW property to investigate poor responses to triclabendazole for fluke control. Following are results from VHR (Veterinary Health Research) diagnostic testing. The graph was made for general communication so forgive the lack of detail. The figure shows percent efficacies from a faecal egg count reduction test (fluke eggs counted using a sedimentation technique), which included an untreated control group, a Fasinex®(Novartis)-treated group (7% faecal egg count reduction (FECR)), a Flukazole® (Virbac) group (39% FECR) and a Closicare® (Virbac; closantel) group (100% FECR)”. “The higher kill rate of Flukazole® (triclabendazole + oxfendazole) in the face of resistance is an interesting finding and somewhat consistent with Dr Joe Boray’s synergy work many years ago. Virbac will continue to recommend Flukazole® as the preferred product in sheep to help delay onset of resistance. Cattle of course have a Nitromec® (nitroxynil + clorsulon + ivermectin) option”. “Virbac is working with Charles Sturt University and faecal antigen testing to learn more about this type of situation”. Closicare (closantel): adult and immature liver fluke including 6 week old stages. Flukazole (triclabendazole + oxfendazole): For the control of … early immature, immature and, mature liver fluke in sheep. This table lists efficacies of various flukicides. Virbac and others have been collaborating with Charles Sturt University, Wagga Wagga on investigations into liver fluke, including the use of a commercial coproantigen test kit (BIOX) which is available for use in ruminants. Brockwell and others (2014) reported some of this work. The cost of liver fluke and the numbers of cattle (>6 million) at risk in Australia is discussed. Triclabendazole (TCBZ) is the preferred drug for Fasciola hepatica control (efficacy against immature and adult stages). (Although it seems to me another option in cattle – Nitromec® (Virbac; nitroxynil + clorsulon + ivermectin) has similar efficacy). However there are reports of TCBZ-resistant F. hepatica from different regions around the world. TCBZ resistance was first reported (in the world) from sheep in Victoria, Australia (Overend and Bowen); ‘now occurs in several parts of Europe, with TCBZ resistance being reported in several countries in both cattle and sheep, and a human case reported in the Netherlands. The authors investigated TCBZ resistance in F. hepatica in naturally infected Australian beef and dairy cattle herds and assessed methods of measuring the levels of resistance. The methods: Faecal egg count test (FECRT), although this has not been validated for fluke (Coles et al, 2006), and coproantigen reduction test (CRT). Faeces (for both tests) collected pre-treatment and generally 21 days post-treatment. (My recollection is that Boray prefers 28 days for FECRT for liver fluke. Wood et al (WAAVP, 1995-guidelines for clinical trials with Fasciola), suggest 21 days. Reasons for this suggestion of 21 days: time for removal of adult fluke post-treatment and for removal of eggs in gall bladder, and time for immature fluke surviving treatment to mature to antigen production). The authors discuss the pros and cons of doing post-treatment collections for FEC and the coproantigen ELISA test (CT) earlier, e.g. 7 days and 14 days post-treatment. Brockwell et al (2013) found both FEC and coproantigen levels fell to negative values within 7 days of successful TCBZ treatment of artificially infected cattle. Flanagan et al (2011) reportedly used a 14 day interval for FEC and CT in sheep and found antigen levels generally fell to zero by 14 days post-treatment. However Novobilsky et al (2012) state a 7 day interval may not be appropriate when testing albendazole. The CT reportedly shows ‘moderate to good’ correlations with parasite burdens in cattle (R2 ranging from 0.239 to .871) (Brockwell et al 2013) and 0.899 in lambs (Mezo et al, 2014). Roblez-Peres et al (2013) found PCR to be more sensitive than the BIOX CT in detecting drug resistant fluke (and others found PCR and CT to be more sensitive than FEC), however the CT in that case was used at the BIOX recommended cut-off rather than a custom cut-off. Other characteristics: samples can be stored frozen for use at a later stage using the CT and transport delays have less adverse effects (c.f. FEC). ELISA technology – which the CT uses – is almost universal in diagnostic labs whereas skills necessary for ID/differentiation and counting of trematode eggs is not. Flanagan et al (2011) have already shown the FEC and CT are suitable for use resistance investigations in sheep. This coproantigen test is the same as used by others (Well, it does come as a kit (BIOX)). The specificity of the CT ELISA has been determined in studies of natural infections of gastrointestinal nematodes, Moniezia, Dicrocoelium, Echinococcus; as well as Paramphistomum cervi. Brockwell et al (2013) and also Palmer et al (2013; see WormMail Sept 15, 2014) improved the test’s sensitivity by removing false negatives, achieving this by using a revised or custom (lower) cut-off point c.f. the kit’s recommended cut-off. The farms: FECRT and CRT were done on six south-eastern Australian beef properties where TCBZ failures were suspected (three in north eastern NSW – Irvington, Caniaba, Parrots Nest; two in south eastern NSW – Gireke and Numbugga; and one in north eastern Victoria – Tallangatta Valley) and one dairy property (Maffra, Vic.). The CRT was conducted on an additional beef property (Nimmitabel, south eastern NSW). Protocol: 15 animals were treated on each farm with an oral preparation of TCBZ at the recommended dose; 15 animals remained as untreated controls. Fluke eggs in faeces were counted and coproantigen levels were measured before treatment and 21 days after treatment and in the untreated control animals. Data: ‘evaluated using three different methods to calculate % reductions (in the FECRT and CRT) compared with controls. Resistance was defined as <90% reduction, the standard used for Australian flukicide efficacy trials. 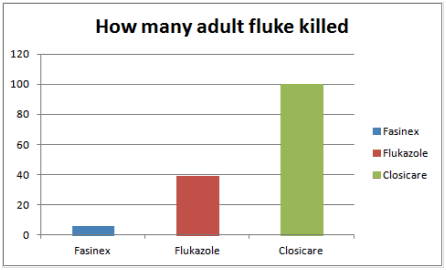 (Others define resistance to flukicide as <95% reduction, as with nematodes). Of the 3 methods, the authors favoured the RESO technique (recommended by the World Assoc Advanc Vet Parasitol (Coles et al 1992), which compares post-treatment arithmetic means of treated and control groups because it generates less statistical error, relies on post-treatment results only and is, accordingly, cheaper. (It seems most authors, including Coles et al, do not state what the acronym ‘RESO’ (a method, software and Excel spreadsheet for analysing FECRT data) stands for. My hunt for (the) meaning continues). Results: Resistance was detected on the dairy property using both FEC and CRT, and on 3/6 beef properties using FECRT and 4/7 beef properties using CRT. false positives. The correlation between FEC and fluke number was R2 = 0.1801 and for coproantigen R2 = 0.3542, but note small sample size. (See above (under methods) for other comments on correlations). There was discussion as to the origins of the resistant isolates (on-farm selection +/- importation/translocation from other farms) and it was noted resistance was not found in the NE NSW cattle farms. (Genetic studies are underway (Elliott et al, 2013) and may shed light on this). Resistance may not be the only reason for treatment failures. Other reason include: maladministration of drug, reduced drug quality (from poor handling etc) and hepatopathies which may affect metabolising of drugs. The example of the Leon isolate is cited. It was reported to be resistant but subsequently FECRT, CRT and necropsy findings showed it was susceptible. The authors see the CRT as a robust alternative to the FECRT for evaluation of TCBZ resistance in F. hepatica in cattle. Brockwell YM, Elliott TP, Anderson GR, Spithill TW, and Sangster NC. (2014). Confirmation of Fasciola hepatica resistant to triclabendazole in naturally infected Australian beef and dairy cattle. International Journal for Parasitology: Drugs and Drug Resistance.Volume 4, Issue 1, April 2014, Pages 48–54. As always, read the paper and check the references for yourself. (…verify). (But I think my summary is almost as long as the paper…). It turns out the suspected MPL-resistant Teladorsagia (brown stomach worm) isolate is not from sheep, but is from a goat property. In fact, it is from the goat farm in NSW which was the source of the first reported confirmed* case of MPL resistance in Australia. (WRML June 11, 2014). More information is being collected on the isolates mentioned in the 28 October 2014, so further updates (more detail, property histories are likely). *Confirmed by faecal egg count reduction test and slaughter study. I was just quickly perusing the summary of WormTest results for October from Veterinary Health Research. (By the way, all identifying data in these summaries is deleted). The highest worm egg counts (WECs) were generally in the New England region of northern NSW, ‘though overall WECs are much lower than normal because of the near record dry conditions, especially in the north of NSW. As Lewis Kahn has noted elsewhere, we (New England region) have now had three failed Springs in a row. Nearby regions are in a similar situation. Despite this, there is still the occasional flock with relatively high WECs, e.g up to 3000 eggs per gram (with some individual sheep up to 2-3 times higher than the WormTest group average). In most cases these higher WECs are mostly Haemonchus but I noted one which was mostly Trichostrongylus. There was a WormTest average WEC in Tamworth district of just under 6000 epg (again, Haemonchus). Elsewhere in the state WECs were generally low, although there was one at Yass with an average WEC of ~ 2000 epg. But, a DPI colleague from Yass (Phil Graham) tells me they had an excellent season this year leading into winter with frosts coming much later than usual. With relatively high WECs, especially under dry conditions, you can usually bet that the unwitting use of ineffective drenches is part of the problem. Assume nothing. Do regular DrenchChecks, including checks of newer drenches (Zolvix® (monepantel) and Startect® (derquantel+abamectin). LiceBoss on-line learning now on-line! ‘Seeing a lot of Type 2 Ostertagiasis at present. ‘Have been through a tough winter and spring and individual cow’s immune system down. Cases confirmed by plasma pepsin, at autopsy and histopathology on abomasal wall’. Phil further said they get cases in most years (Spring), but there have more cases this year. . Some are 1st calf heifers; also individual older cows in a mob. The main differential diagnosis in that area is bovine Johnes disease. About 80% of herds in the area have poor cattle; a reflection of prevailing dry conditions in northern NSW. Conditions are also very dry in Queensland. ‘I have been dealing with inquiries about water quality and quantity. SheepconnectNSW has been providing information to sheep producers on this. Sixty two % of the SheepConnectNSW newsletter recipients clicked on the provided links to PrimeFacts on water’. ‘Below are links to PrimeFacts on livestock water. More than usual, producers may find water a critical issue this summer. It is interesting to note that research into water storages at Yanco NSW by Dr Harnam Gill shows that 50% of stored water evaporates over summer. This may be important in some situations so regular monitoring of the resource and consideration of what the livestock have to drink is important and more so in hot and windy conditions’. An audit of stock water using is a useful start to knowing the situation. · Salmonella – after USDA veterinarian, Daniel E Salmon (not Daniel Salmon, LLS veterinarian at Deniliquin, NSW). · Brucella – after Bendigo-born Scottish pathologist and microbiologist Major-General Sir David Bruce who investigated Malta fever (B melitensis) in British soldiers. · Johnes disease – after Heinrich A. Johne, a German bacteriologist and veterinarian. ‘The DOGS+CELLS Trial aims to discover whether brain engraftment of ‘patient specific’ stem cells derived from a dog’s own skin can help treat the dementia-like syndrome, Canine Cognitive Dysfunction (CCD)’. ‘If successful this world-first study will pave the way for similar clinical trials in humans with dementia’. ‘What is canine cognitive dysfunction (CCD)? CCD is a dementia-like syndrome that occurs in approximately 12-14% of dogs more than 10 years of age. CCD is a progressive and ultimately fatal disorder with no proven effective treatment. It is devastating to the human-animal bond. CCD also has clinical, epidemiological, pathological and pharmacological similarities to human Alzheimer’s dementia’. ‘Meadow Lea adds sugar to margarine to entice kids’ ? According to Gillespie, the sugar content of the product ranges from 17.8% to 20.5% depending on the flavour. Do you remember when they used to add sugar to toothpaste? I think they just use artificial sweeteners now. But, a new brand of toothpaste contains special stuff that neutralises acids from sugar, so there is no need to moderate your intake of sugar. Whew! We westerners can still consume our average of 0.6 kg or so of sugar ( = ~ 0.3 kg fructose) per week – not including fruit juices (which are typically ~ 10% sugar). “For the boffins: I might point out that VHR (Veterinary Health Research) has the capacity to do PCR as well as traditional parasitology when it comes to differentiating worm species. Some of you will know that when it comes to larval differentiation, there can be problems when using traditional techniques (morphology) to accurately/consistently tell the difference between Trichostrongylus (black scour worm, stomach hair worm) and Teladorsagia (brown stomach worm) larvae. For example, short-tailed Teladorsagia can look just like Trichostrongylus”. “I think the development of PCR techniques for identifying worms is great. I now have a lot of experience in this field with both L3, L4, and adults, but it would be interesting to see how I rate against the PCR. As to larval differentiation in particular, I am quite happy with my results. Robin McAnulty and I have done a little comparison of results and we concur on what we see in sheep and cattle. We don’t find any problem in differentiating Teladorsagia/Ostertagia and Trichostrongylus. Teladorsagia/Ostertagia have an obvious buccal capsule under my microscope and an anterior shoulder. Trichostrongylus have a smooth anterior end and no buccal capsule. Generally Teladorsagia/Ostertagia are bigger than Trichostrongylus, but sometimes there are “small” Teladorsagia/Ostertagia seen, and they can be present in quite large numbers. I would love to see PCR deal with this! “This is such a cool website Steve – I almost want to know more! I love the way it is presented so simply and logically! WOW – and that was just a quick look. All websites should be like this! I do like cats, most animals in fact (except maybe flamingos). Cats just do what cats do. The ultimate problem I think is humans. Livestock impacts: Cats are the primary host of the disease-causing parasites Toxoplasma gondii (toxoplasmosis, or ‘toxo’) and sarcocystis (‘sarco’). Toxo causes abortion or stillbirth of lambs, and is present in more than 80% of Tasmania’s feral cat population (one of the highest rates of the disease in the world). The disease has caused up to 50% lamb losses in maiden ewes. The Oatmeal – how much do cats actually kill? I suppose like others I have wondered for decades if behaviour of livestock could be used to improve animal health, including management of worms. I thought the introduction of electronic ID might lead to breakthroughs. “Now, a team of researchers at the Cajal Institute in Madrid, led by Gonzalo de Polavieja, has launched idTracker—an image-tracking program that maintains the correct identities of hundreds of individuals in a video with almost 100 percent accuracy, regardless of how similar they look and how many times they cross each other’s paths”. “The study of animal behaviour has been stuck in traditional methodology for far too long and is stagnating as a result. This type of technology will revitalize this field”.—Iain Couzin, Princeton University. You probably know that dogs are somewhat sensitive to chocolate poisoning, specifically, theobromine toxicity. The artificial sweetener, xylitol (a sugar alcohol) can also cause problems for dogs: hypoglycaemia and even liver failure. It seems it’s best for animals to stick to the natural diets to which they are adapted. (Excluding humans of course…. J ). ‘Doveryai no Proveryai ‘ (Trust, but verify). WormBoss Online Learning is now live for all regions. It is set up so that users first choose a region. Within each region there are seven topics. Within each topic there is structured reading and a set of question and answers. The reader can choose to look at either or both as a means to learn about the topic. The structured reading directs the reader to the relevant pages on the website. The question and answer section has questions covering the important topics for each section and the answers are provided below.